This week I’ve been talking about my own creative inspiration via knitwear designers and filling the creative well. In Part I, I talked about the funky bags of designer Nora J. Bellows at Noni Design. In Part II, I waxed poetic about Irish designer Kieran Foley and his Downton-Abbey-inspired shawl homage to Lady Violet Crawley. But, today, I need to give a shout out to hip designer and American ex-pat Stephen West. I’m a fan of many, many knitwear designers, but Stephen West has become a favorite very quickly. He’s an American living in Amsterdam, so he’s got that ex-pat thing going for him. In addition, his designs look great on both men and women–another plus in my book. He blogs here. His boyish good looks are maybe part of his appeal for me (he often models his own work), but I love the unique construction of his scarves almost as much. 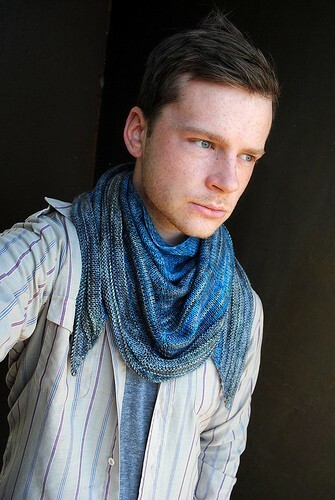 His Spectra scarf has all the things I love: intense color, interesting construction, and it looks cool. (And, yes, that’s him acting as model.) He’s even got a circular bag called the Sun Satchel that includes felting, so I gotta buy the pattern…stat. Sure, I love me some knitwear designers, but it’s their ideas that surprise me. The colors, the shapes, the construction–I will never get tired of seeing all the cool new things they dream up. And, sometimes, I can knit something for myself or someone I love that reminds me of the sheer guts of trying something off-beat, quirky, funky, and fun. It’s that feeling of something surprising hidden within the same old, same old, that I want to instill in my writing. So, fellow writers, where do you find inspiration?